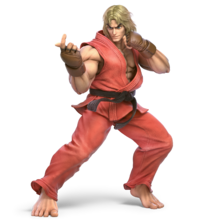 Ken Masters is one of the central characters of Capcom's Street Fighter series. He is the best friend and rival to Ryu, and uses improved Shoryuken ki techniques to fight. He has made crossover appearances in the Super Smash Bros. series. 1.1 Super Mario Klemp-Won-Do: Muskeln sind nicht alles! Super Mario Klemp-Won-Do: Muskeln sind nicht alles! The German Club Nintendo magazine published a 1992 comic titled Super Mario Klemp-Won-Do: Muskeln sind nicht alles!, which features various characters from the Street Fighter series. Among the characters Mario meets in the comic are E. Honda, Dhalsim, Chun-Li, Blanka, and Ken. Ken makes his first appearance in the Super Smash Bros. series as a trophy in Super Smash Bros. for Nintendo 3DS and Super Smash Bros. for Wii U, obtained upon downloading Ryu. Ken appears in Super Smash Bros. Ultimate, as an unlockable character and an Echo Fighter to Ryu. He shares many similarities to Ryu, though he focuses more on the use of his legs and moves faster because of it. His Shoryuken and Tatsumaki Senpukyaku can deal repeated damage unlike Ryu, and his Hadoken has a graphic of his hands displayed within. He shares his debut trailer with Incineroar. In said trailer, Ken, on the Boxing Ring stage, successfully KOs Little Mac, before being knocked out himself by Incineroar. Luigi Mario Bros. Underground Theme - Super Mario Bros.
"I'm ready for ya. Bring it on!" "I knew I'd win, ha!" "Challenge me after some practice." NA: Ken has been Ryu’s number-one rival and best friend since they trained together as children under the same master. In fact, the headband Ryu wears was a gift from Ken! Along with being a very talented martial artist, Ken is also heir to his rich father’s Masters Foundation. But sorry, would-be suitors, Ken’s married and has a son! PAL: Ken has been Ryu's number one rival and best friend since they trained together as children under the same master. The head band Ryu wears was a gift from Ken. Heir to his rich father's Masters Foundation, Ken is a highly skilled martial artist, but eventually goes home and becomes a family man with his wife Eliza and their son, Mel. Palutena: He's the son of the Masters family and a U.S. martial arts tournament champion. Pit: I heard he's filthy rich! Viridi: Sounds like someone needs to up their angel's allowance. Palutena: Back to Ken - he's energetic, cheerful, and boisterous. Pretty much the opposite of Ryu, who has a much more serious personality. Pit: Uh...Why are their attacks so similar then? Palutena: Ken and Ryu are friends that trained in the same fighting style. Palutena: It's a martial art close to Karate that originates from Ansatsuken. They're known to use Hado as well. Pit: You know, Ken doesn't seem like such a bad guy. Palutena: Let's just hope he doesn't give in to the Dark Hado. Palutena: OK, gossip time! Did you know Ken's wife Eliza is also Julia's sister, and Julia is married to Guile? Pit: What?! So Ken is Guile's brother-in-law?! This page was last edited on March 14, 2019, at 07:25.